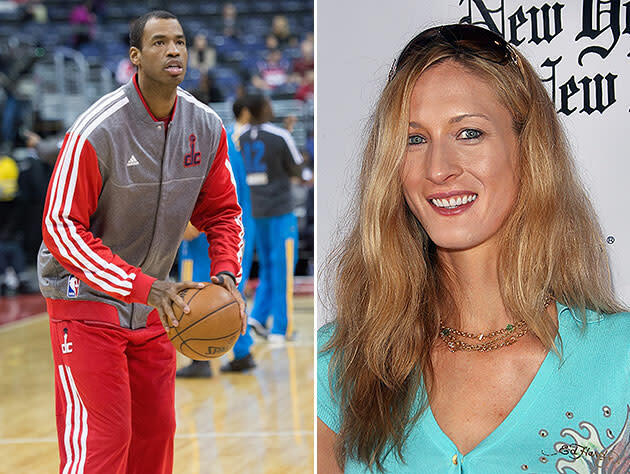 Carolyn Moos says she had no idea that Jason Collins, her longtime boyfriend and fiancé, was actually gay. In the Sports Illustrated piece featuring his groundbreaking revelation, the 12-year NBA veteran wrote, "When I was younger I dated women. I even got engaged. I thought I had to live a certain way. I thought I needed to marry a woman and raise kids with her. I kept telling myself the sky was red, but I always knew it was blue." Carolyn tells TMZ, she never once suspected he was gay, so the news is shocking. She says Collins eventually revealed everything last weekend — just days before his big announcement — and said that his homosexuality was the real reason he ended things with her. "It's very emotional for me as a woman to have invested [eight] years in my dream to have a husband, soul mate, and best friend in him. So this is all hard to understand." Moos, 34, met Collins while the two were both students at Stanford, where she played on the women's basketball team before embarking on a pro career that included stints with the WNBA's Phoenix Mercury, Miami Sol and Minnesota Lynx. The couple dated for seven years and got engaged; Collins ended the engagement in 2009. "Calling off the wedding was obviously a tough decision," Collins said in an interview with ABC's "Good Morning America." "But it was the right one because I knew I wasn't getting married for the right reasons." While Moos told TMZ she had a hard time processing the real reasons behind the relationship's ending, she doesn't harbor ill will toward Collins. "I care about [Jason] tremendously and only want the best for him," she said. "I want Jason to be happy for a lifetime and stay true to who he really is, inside and out."